For day three of the RC44 World Championship, Sotogrande laid on the conditions for which it is famous: brilliant sunshine, wind regularly over 20 knots, monster shifts, but surprisingly flat water in the lee of the Andalusian coast. 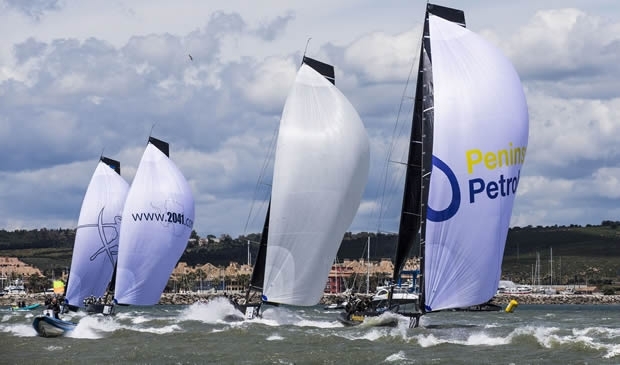 Appropriately local hero John Bassadone and his largely Spanish crew on Peninsula Petroleum Sailing Team were the star performers. Winning the first race brought them level with yesterday's overall leader, Igor Lah's Team CEEREF. The Gibraltar team followed this up with a 3-4, ending the day one point ahead. "I'm extremely happy with how the day went - it was very good fun, tricky conditions," said an elated Bassadone, who was RC44 World Champion in 2012. "We had a fantastic first race, but for me the third race was the best because we managed to claw our way back from a pretty bad position. "The conditions were fantastic for these boats: With strong winds and flat water, the boats really shift downwind. But you also need very good crew work, which luckily we had. The guys have trained a lot and on days like today it really does tell." Bassadone also paid tribute to his exuberant tactician, Vasco Vascotto who managed to call the shifts better than most. "Vasco nailed it today. He's sailing very well…patience isn't always his strong point, but you can tell he's on form, so I'm crossing my fingers…"
Vascotto, attributed their success today to the crew and good starts. "It is so shifty, so you needed to stay in phase and play the shifts well. We were also very motivated – don't try and cover the other boats, just sail your own races." However the Italian, who has more than 20 sailing World Championship titles to his name, is too wizen to rest on his laurels and intends to treat every day as it comes. "Personally I am very happy. Now we need to have a nice beer and a nice dinner and forget as soon as possible about these results." While Peninsula Petroleum is the new leader of the RC44 World Championship Marina de Sotogrande after day two of fleet racing, impressively matching the local team's eight points score today was Katusha, helmed here by Alexander Novoselov. While Peninsula Petroleum led for the first lap of race two, it was Katusha, on which American Andy Horton calls tactics, that ultimately claimed the race. Co-owner of the boat, Alexander Novoselov is steering for this special World Championship, falling in the RC44 class's 10th anniversary year. "It was very good! We very much enjoyed the windy weather and the sun. Finally we have a permanent team and they spend a lot of time on the boat, the sails and checking everything and the coaching. They have been a great help. Today's races were among the best we've had. We're really proud of ourselves." After a disappointing start to their day with two eighth-place finishes, Vladimir Prosikhin's Team Nika won the final race, the first victory of this series for the defending RC44 World Champion. Ashore Prosikhin bemoaned the first races. In race one today Team Nika's position plummeted after they suffered a broach when they'd been unable to release their main. In the second they'd fallen out of phase with the shifts. As Prosikhin observed: "Of course we want to be more consistent, but it's tricky because the shifts are big and the wind range is very wide. Because of that, everyone is sailing with their J2 [headsails] and are often overpowered, because the wind was gusting up to 26 knots. When you're overpowered. its tricky to sail well." According to Katusha's tactician Andy Horton, today typically the wind angle varied by 250-315 degs almost every beat. It was windier than yesterday with gusts into the high 20s, but they also saw light spots when the wind dropped to just 12 knots. "It is a pretty shifty place: If it is a little lighter then it is harder because there is no predicting it. It is easier when there is more breeze." In anticipation of even bigger conditions tomorrow, racing will start half an hour earlier, at 1100 CET.